It will be hard to describe in modern terms the celebrity of Marie-Joseph Paul Yves Roch Gilbert du Motier de Lafayette, Marquis de Lafayette (aka LaFayette) in 18th century America. The young Marquis was fascinated with the American ideal of revolution and against the wishes of the French monarchy, in 1776 he cast his lot with the American patriots. His relationship with George Washington and other American leaders played a major role in the American-French alliance that brought about American independence. 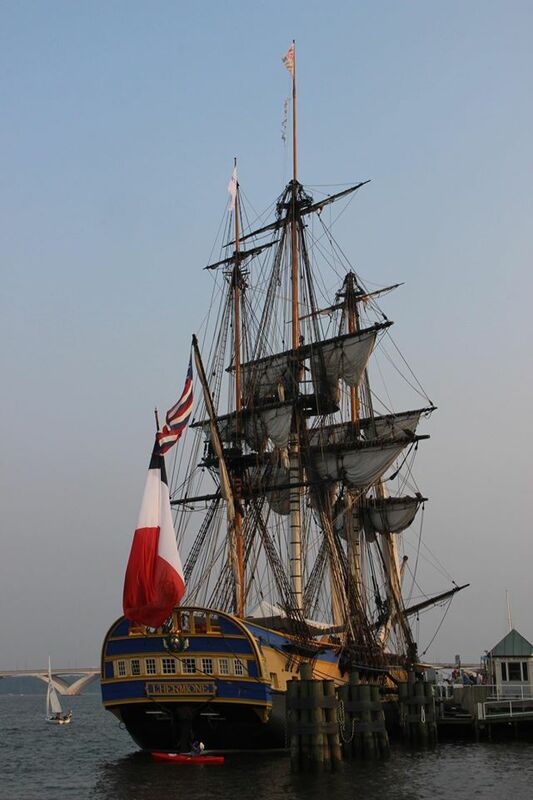 That message of a French alliance was brought by LaFayette in the spring of 1780 aboard the French frigate L’Hermoine. Last week I was in Alexandria to see a modern replica of L’Hermoine. Being the “history nerd” I am, I was excited to see this exact replica of an 18th century tall sail ship. But I was not sure what the interest level would be of the modern public – would they care about this ship and would they know anything about its passenger in history and what he meant to the founding of our nation? As I walked down historic Cameron Street in Alexandria, my first site as I peered towards the waterfront was the top of the main mast. I thought about the Alexandria of the 1780’s – a major seaport that must have had dozens of these ships at port loading tobacco and unloading goods from across the globe. Alexandria at that time was one of the largest seaports in the United States – a far cry from the more recreational use of the waterfront today. As I arrived to the waterfront I was shocked by the “hub-bub” around the docks. There were hundreds of people milling around the ship, dozens in line to see this monument to our seafaring past. My friends with the Office of Historic Alexandria, who were crucial in the logistics of L’Hermoine’s visit, had told me that all the tickets to see the ship were sold out long ago. Not until I arrived did I realize how popular this ship’s visit to the area really was. With nearly 100 degree heat and heavy humidity, lines of people waited on the dock to see the ship. Many more people were in another line to the ticket booth to just find out that the tickets for this ship were sold out weeks ago. 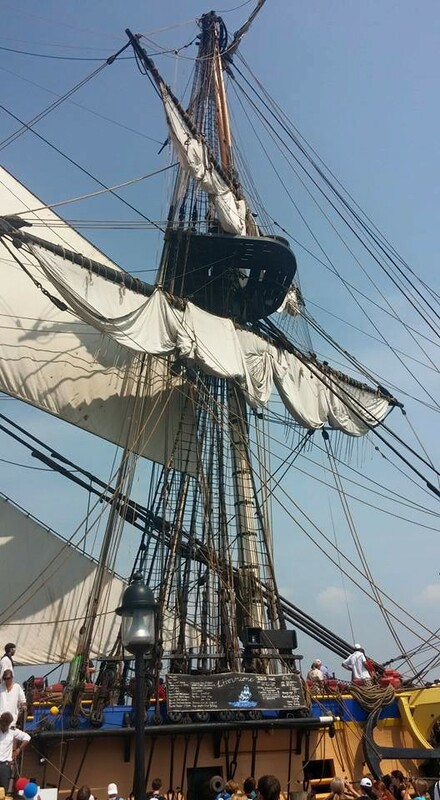 When one sees a ship this size (a medium size war ship for the time), your first thought is “what craftsmanship!” The tall sails, masts and all the rigging (over 15 miles of rope!) that goes into getting a ship like this across the Atlantic is complex. Scenes of the movie “Master and Commander” play through my head as I think about the months long voyage across the Atlantic from Europe to America. The mast of the L’Hermoine. The importance of this ship in American history cannot be understated. Its cargo in 1780 was a single man, the “boy general” the beloved Marquis. He was already a celebrity in the new nation in its fight against Great Britain. But the news he personally carried from King Louis XVI would not only change the war, but also the future of the world. 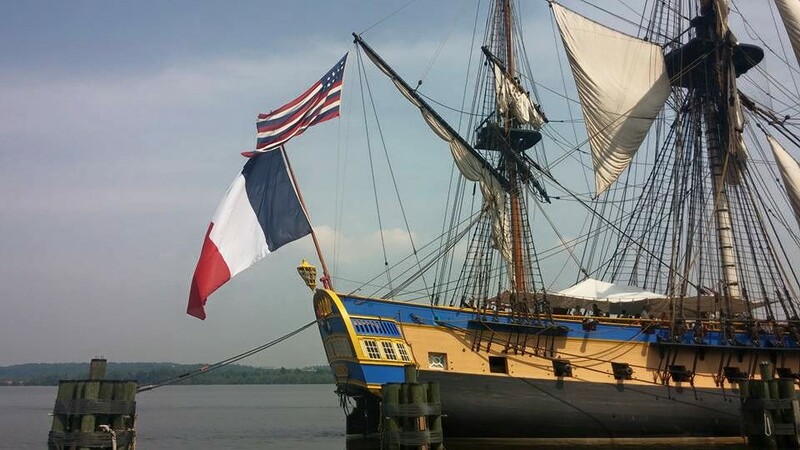 France had recognized the United States of America and was pledging more money, material and most importantly – an army and navy to America’s cause. These stories were told by the staff and interpreters along the dock and on board the L’Hermoine, but I am not sure the general public was there to learn that. They were there to see a piece of history, a throw back to our seafaring past. It was nice to see that, yes, people today DO care about history and our American story. If you get a chance to see the L’Hermoine, it is worth the trip. Just as it was worth the trip for Lafayette and America in 1780. The L’Hermoine proudly displaying the flags of both the United States and France. This entry was posted in Emerging Civil War, Revolutionary War and tagged 1776, Alexandria, American Independence, American Revolution, American Revolutionary War, French Army, French Navy, George Washington, King Louis XVI, L'Hermoine, L'Hermoine 2015, Marquis de Lafayette. Bookmark the permalink. The ship should more historically fly the Bourbon lilies rather than the Republican tri-color. Just sayin’. I thought that immediately! What is up with the flag??? Good point on the flag. They have displayed the proper historic French flag, but on this day (and most occasions) they fly the current French flag. If you visit their website, they do have a place where you can pose them questions. Nice! Maybe it will come to the West Coast in a year or two. It’s wonderful to hear how many people were excited to see the ship.